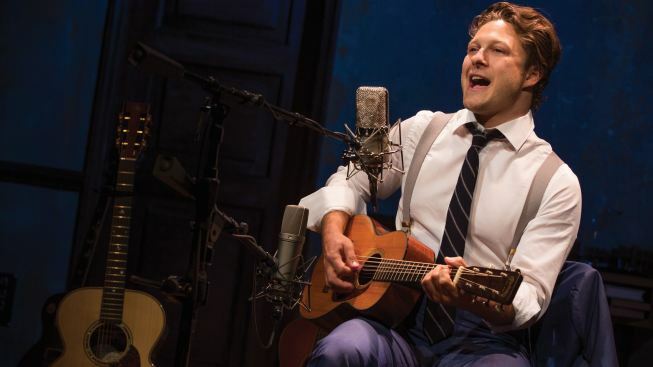 Singer-songwriter Benjamin Scheuer performs "The Lion," his one-man solo musical. Scheuer is discussing the things we do to maintain a sense of control over our lives when chaos rules the day. One way this young man coped with illness in his late 20s was by starting to dress as if he’d stepped out of a Brooks Brothers catalog. It’s difficult to reconcile the story of loss that transpires over 75 minutes with the exuberant, suspender-clad fellow who walks onto stage at the Lynn Redgrave Theatre, where “The Lion” has just opened following a lauded run last year in a Manhattan Theater Club production at City Center (it subsequently played London’s St. James Theatre). Scheuer shares a simple space with a couple of chairs and a half-dozen mostly acoustic guitars, intermittently weaving folk-rockish songs into a tale that moves from event-to-event like Tarzan tree-hopping on jungle vines: We stop momentarily on themes of boyhood, young love, familial estrangement and disease, settling ultimately on some sort of reconciliation to circumstance. Scheuer’s story begins benignly enough, with the young man recounting an early memory of his mathematician father, who once made him a banjo out of a cookie-tin lid and rubber band strings. “Cookie Tin Banjo,” which opens and closes the piece, is a song so chipper and good-natured you might think you’ve stumbled into Disney’s Country Bear Jamboree. Matters turn dark in short order, though, as we learn more about Ben’s hard-to-please dad, an erratic man whose conflicts with teenage Ben are the focal point of the musical’s first half. We also meet Ben’s mom, a Brit, and his two younger brothers, later characterized as the “cubs” Ben will learn to watch over. Scheuer’s voice is powerful and strong, his manner charismatic, and his songwriting easy to become lost in. “I’ll Bet Loving You Would Be Easy” is a story about a bit of normalcy, his first love affair, which interrupted the so-far gnarled bookends of his life. “A Surprising Phone Call” is a poignant and unexpected piece imagining an impossible exchange between his parents. The songs in “The Lion” originally were part of an album Scheuer recorded with his band, Escapist Papers. Director Sean Daniels, who here handles difficult subject matter with enormous care, later helped shape the material into this play, with its appropriately metaphorical title (the imaginative animated video for the musical’s eponymous penultimate number can be seen here). As the evening goes on, Scheuer’s tie is loosened, and his shoes and socks come off. What’s revealed is a confident performer opening himself in ways that few solo performers ever do. Scheuer brings not a trace of self-pity to his tale, but this kind of zest for life could only originate from a man at peace with his lack of control over the universe. When Scheuer sings “Inside my gentle paws, I’ve got some devastating claws … and I’m learning what it means to really roar,” we realize it right along with him—he’s got the might and mane to carry on. “The Lion,” through March 29 at the Lynn Redgrave Theatre, 45 Bleecker St. Tickets: $26-$75. Call 866-811-4111.